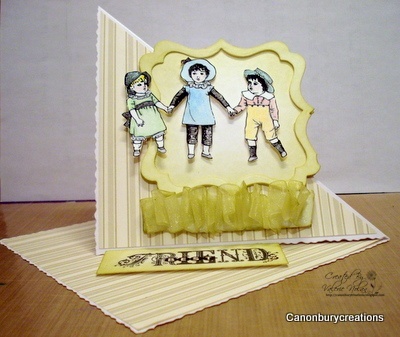 This week's challenge over at Do It With Digi's is Boy's and Girl's come out to play and I decided to use a lovely vintage digi stamp that I got from Paulette at TLC. I made a twisted easel fold and covered it in some Anna Griffin paper in soft green stripes. I coloured the image with brilliance inks and a water pen and cut it out so I could mount it both in and out of the frame. The frame was distressed with Shabby Shutters as was the strip of ruched ribbon. The sentiment is also from TLC and says Best Friends. Love your card, the images are so sweet. Another FAB card, I just love these images from Paulette. Thanks for joining us at Do It With Digi'sthis time round. Hope to see you again.